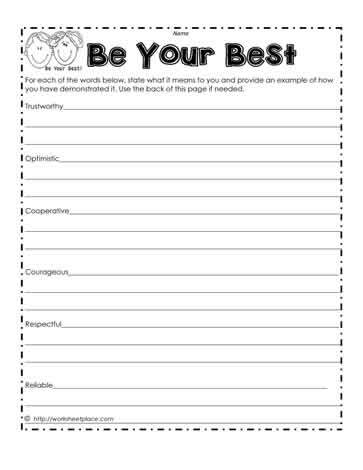 This character worksheet requires students to write about how they are trustworthy, optimistic, cooperative, courage, respectful and reliable. They provide examples of how they behave according to the character trait. It is also helpful to to focus on a specific character trait each month. For instance, let's say the character trait is courage. Let the students brainstorm what courage means to them. Then have them talk about all the times they have been courageous. (Having the courage to do the right thing even though it's difficult.) Ask them to consider how they could improve this trait and have them write specific goals to help them become more courageous.